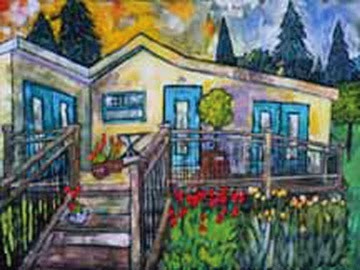 The Art Cottage & The Art Studio 2-min. drive or 15-minute walk from town; rent through airbnb.com. Off-street parking is provided for both units. Designed by an artist to rejuvenate your spirit, these quiet retreats are located in a quiet residential area. Bright colors and plenty of art is factored into the decor--even art-related videos are provided. If your party rents both units, you can open the gate between the properties and share the yards. 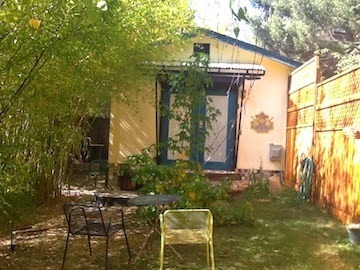 The Art Cottage This cozy vacation rental has two bedrooms and two baths (one with a whirlpool tub) and can accommodate three guests comfortably. Amenities include a full kitchen with granite counters and a private yard with barbecue. The Art Studio This sister rental is a smaller studio apartment. It has a full kitchen and is perfect for a single guest or for a weekend stay for a couple. The up-to-date bathroom has a shower with twelve massage jets. More things to do in Nevada City.